Jumbo sticker proclaiming the bearer to be on "Santa's Good List"
Several letters styles available to suit any occasion. Most letter styles are available in several different formats so multiple children at the same address each receive a different letter. Click on the Letter style below to view an example. *Indicates multiple variations of this letter are available, so two recipients at the same address will not receive the same letter. will appear on the envelope. Invalid characters. Must be alphanumeric with US symbols only. Enter recipient's first name as you would like it to appear on the letter. Do not enter "Dear" or a final comma. Optional Custom Text Block: (Maximum 254 characters). Please enter custom text in sentence case using upper and lowercase letters. **If you choose to add your own custom text, we will substitute it for one of the existing paragraphs of our choosing. For a longer letter, use most of the characters allowed. 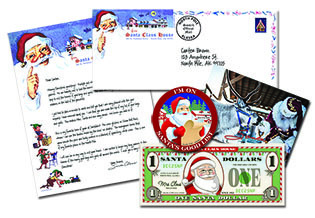 Children today receive Santa letters with the same squeals of delight as children who received the letters generations ago.